Online Audio and Online Video Content Marketing Specialist - I have developed, produced, syndicated and promoted online audio and online video content to help marketers better engage their constituents. The help the United States Marine Corps Recruiting Command, I produced a series of videos about the transformation of becoming Marine. I also created videos for the United States Marine Corps Defense Media Activity during Marine Week Boston. 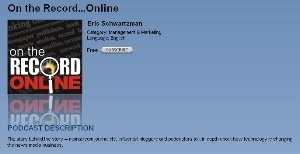 Learn Social Marketing to the Business Customer from Eric Schwartzman on Vimeo. To encourage a future generation of opera aficianados to become season ticket holders, I created the award-winning "Behind the Curtain, at the LA Opera" podcast, which was partially responsible for an increase in ticket sales of 22 percent. 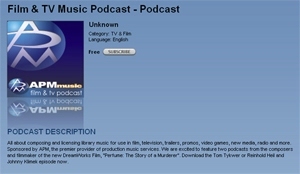 The Film & TV Music Podcast, which I created, produced, syndicated and promoted for APM Music became the official podcast of the Hollywood Reporter/Billboard Film & TV Music Conference, resulting in hyperlinks directly from these outlet's websites to our client's podcast center, as well as editorial coverage of the podcast in these prized mastheads. The APM Film & TV Music Podcast was the recipient of the 2007 Bronze Anvil Award for Best Podcast, the highest honor bestowed by the Public Relations Society of America for podcast communications initiatives. Since 2005, I have also been producing the award-winning social media podcast On the Record...Online, which features one on one interviews with reporters and newsmakers about how technology is changing the way organizations communications and the way people consume media and information. Nearly a million episodes of On the Record...Online are downloaded each year.